Can Palestinians Recognize Israel’s “Jewish Character”? Whatever Happened to the Quartet? Congratulations to the New State of Palestine! Could American Firms Choose to Gradually Disinvest from Israel? Isaac Herzog's Diplomatic Initiative: Can This Detour Be Reframed Into a Road to Two States? America’s Abstention at the UN: Well Played! Lapid: A New Leader for Israel? 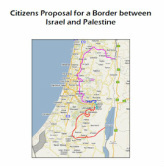 The Citizens Proposal for a Border between Israel and Palestine is suspending the operation of its website. In the current environment, without casting blame, it is clear that one or both parties are not willing to negotiate on behalf of all the people in the region. Until such time happens, there is not much we can propose unless there is substantial movement by persons of good character in positions of authority. Without the good will to negotiate a two-state solution, it can no longer be taken as a given that the nation-state of Israel can continue to exist in its current form. If that is to be the outcome, we support the concept that through time the land between the Mediterranean Sea and the Jordan River will become one state that reflects the demographics of the people that live in it. We also demand that the world ensure that such a one-state reality is equitable to all of its citizens.